Earlier this month I wrote a post describing a kind of game that we are playing with our Spring Leaves Family Learning group (see Archipelago!). As well as being a game on paper, it also opens many doors to our choice of related physical activities within the theme of outdoor living in a wilderness setting. 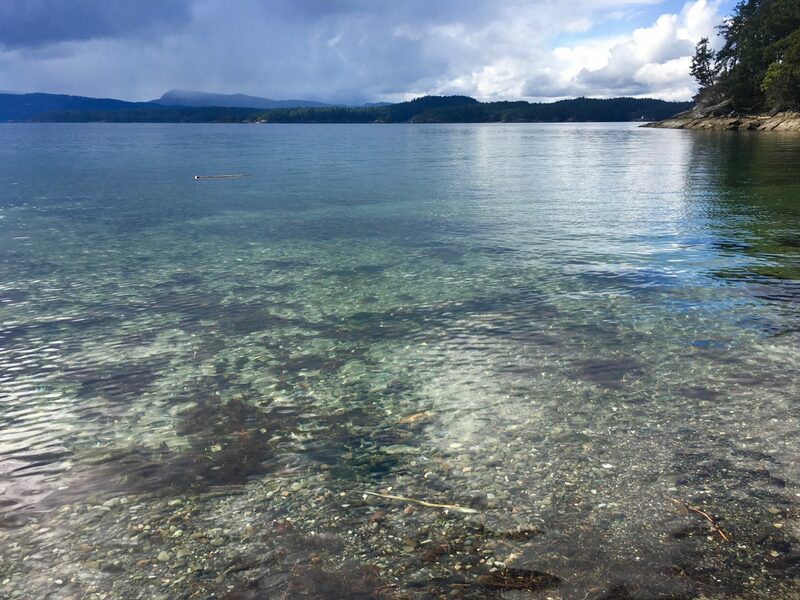 The past month has seen many adventures for us around the island, and as the spring progresses, many more fun skills and experiences are on the schedule. One of the highlights was using the Hope Bay Bible Camp grounds and equipment for 4 sessions for archery! This activity was requested from the children way back in the fall, and finally getting 4 weeks of beautiful weather to practice 2 hours of shooting each week was a great opportunity for kids and adults. An instructor from the island was able to lead us in our first session, and help us to refine techniques at the last session. In between, we simply rotated through the practice of stance, balance, breath, and aim, as well as practicing safety measures. Some of the older kids in the group already have experience with a variety of archery sports, and were able to help demonstrate and answer questions when the instructor wasn’t with us. I was amazed at the capabilities that emerged from week to week for all the children, and felt myself connecting easily to this ancient activity. Besides being a hunting sport, it brought for me a sense of relaxed focus and empowered strength and clarity. 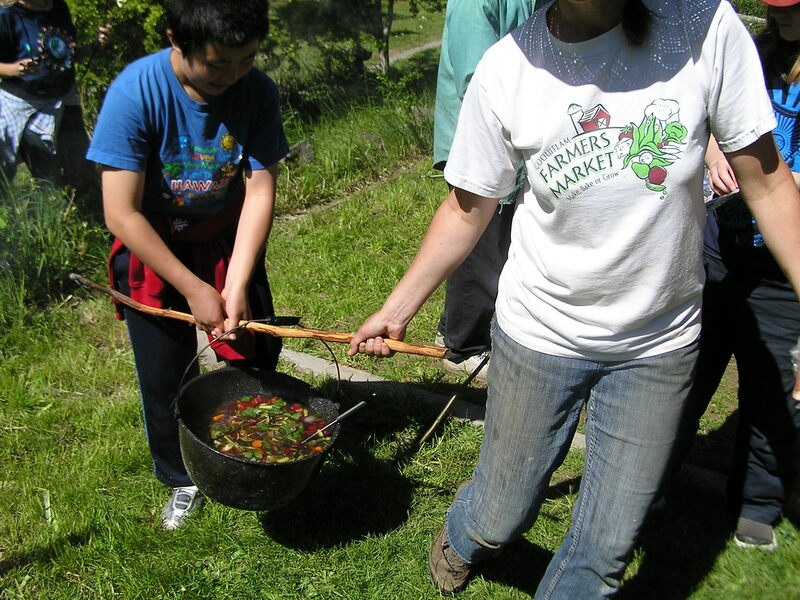 We spent some time considering the practices of gathering, cooking and eating in an outdoor setting. Earlier in the spring we spent a morning at our house identifying a variety of wild spring greens that grow around our property and all over the island. Some were familiar to the kids already, like dandelion and miners lettuce, and some were new, such as cleavers, sheep sorrel, chickweed, peppercress, and plantain. We added lemon sorrel from the garden, kale, and lettuce, and tossed everything gathered with a light balsamic dressing for lunch. A few weeks later we met at another families’ house and did some campfire meals. A fire had been started in the morning so there was lots of hot coals when we arrived, bringing with us a variety of chopped vegetables for a soup. There was potatoes, yams, carrots, kale and chard, onions, tomatoes and a variety of freshly clipped herbs from the garden. There was even some dried seaweed that some of the kids had prepared from an earlier excursion to the beach. We put everything in a large soup pot, set in on the pile of coals, and let in simmer away for the rest of the morning. We also dug a hole in the ground near to the fire, put tin foil wrapped veggies into it and buried them with more coals from the fire. A layer of earth went on top to make a kind of pit oven. We also had the makings for bannock, and once the other dishes were cooking, we got into mixing up the dough and sharpening alder prunings for cooking sticks. The older kids started a smaller camp fire for grilling veggies and meats, and for roasting the bannock on the sticks. 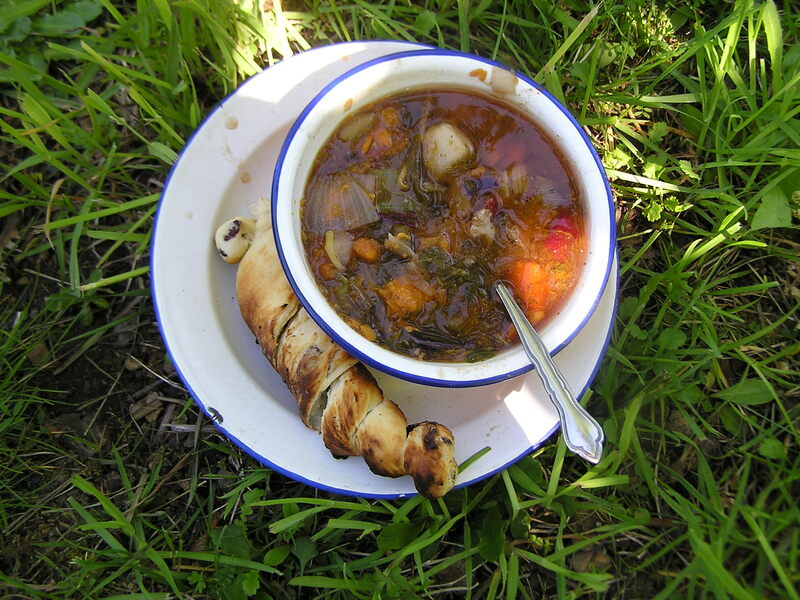 It was a feast of beautifully simmered soup, toasted bannock, and grilled kababs and sausage. The communal feel of this outdoor meal making was heartwarming and fun, and at times we contemplated how this would feel if it were everyday, and every meal. Each person might have their consistent role or job, and the interactions of every community or tribe member would be counted and important for the whole to function on this basic daily level. There was still room for individuality to flourish, and new creative ideas to come into being as the many hands and minds come together and find their place. We also had some fun considering shelters and furniture. In two afternoons at the forested property of one of the Spring Leaves families, we experimented with different types of debris shelters made from the collected materials of the forest and built without tools. 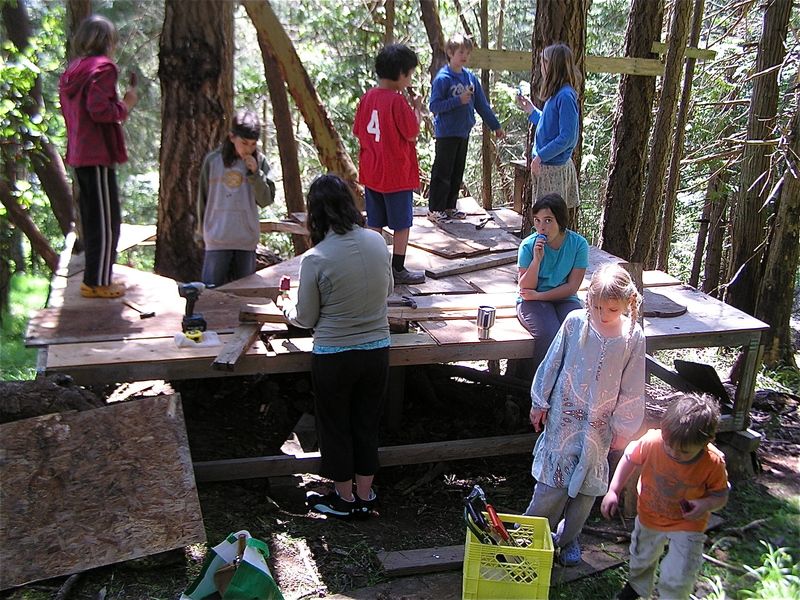 Mostly in small groups, the kids started with finding a place that already had some kind of supportive feature, then they gathered branches for beams, sticks for ribs, and leaves or bark for insulation. Each one was entirely different, shaped by different eyes and ideas and ages. We also spent time learning the art of making rustic furniture with lashing, led by my mother Willow who remembered her own experiences from when she was a child. We had some simple plans and a forest full of fallen branches that we collected and sorted into piles of different thickness and length. One group constructed a four legged table with a tall back on one side to hang things for drying, and another team made a three legged wash stand. We learned the patterns of lashing, whipping and frapping as a means of joinery and strength. A few weeks later we met at another of our families homes and handed the kids hammers, nails, saws, drills, and scrap plywood and lumber. They were going to build a fort onto a previously framed up platform about 4 feet off the ground and nestled around the trunks of 3 fir trees. The flurry of activity hardly faltered all morning as plans were discussed and hammers pounded. A floor was completed and two short side walls were attached before the energy waned in the afternoon, but there was much enthusiasm for further improvements and for the imaginative games that the fort will provide a new space for.